Today I found myself in an annoying situation. I discovered, last week, that the batteries in my pH meter (ok not what every girl has in her collection of electronic gadgets, but I’m an ecologist!) had run out. I had been disorganised and not checked it before I went off to teach my course, so the whole thing was rather unfortunate, but not the end of the world. Once the batteries have gone, buying new ones is not all you need to do – the thing needs recalibrating so that it continues to be accurate. So, I needed to buy both new batteries and buffer solutions*. My pH metre – not being replaces! 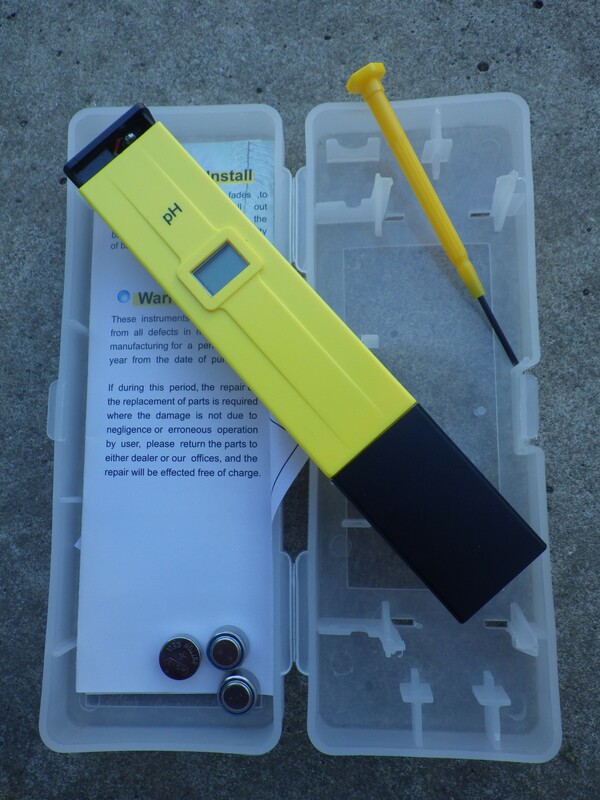 A quick internet search revealed what I had suspected – that I could buy a new pH meter complete with batteries and sachets to make up the buffer solutions for less than the two separately without the meter. I hate this situation – in a world of finite resources it should always be cheaper to buy the components to repair something or get it working again than it is to buy a whole new one, but the drive towards ever more consumerism prevents this**. Of course, once I have the buffer solutions they will last for some time and I won’t need to buy more for quite a while, but even so, the outlay right now is what gave me pause. I’m sure you won’t be surprised to hear that I didn’t buy a whole new gadget, but I have been muttering about it since. These days, we do try to purchase repairable items, so I was delighted to hear from a friend about ISE***, a manufacturer of washing machines that are specifically designed to be mended when they go wrong and for which the components are readily available. Not only that, but they make their machines to last – they claim an effective lifespan of over 20 years, which seems pretty good compared to the complete absence of claims by other manufacturers. Just the other day I noticed that our current washing machine (a Zanussi about 13 years old – not bad!) was starting to make a slightly odd noise and so a new one might be necessary in the not-too-distant future. If so, we will certainly be investigating machines like the ones made by ISE, even though cheaper makes are available. One fact still remains, which is that not everyone gains from increased lifespan as reduced consumption. This is not very attractive if your business relies exclusively on the sales of new products. Therefore, you will not see ISE in conventional large electrical retailers, they are exclusively available on-line, through independent service sellers whose survival is not reliant on ‘the next sale’ and for commercial clients who can contact us direct. Now, that’s a refreshing approach! * These have known pHs and you adjust your meter so that it’s accurate for two values (usually pH 4 and pH 7 or 10) and thus is good for the whole range. ** If you want to know more about this problem, take a look at The Story of Stuff… a real eye-opener if you haven’t seen it before. *** UPDATE 2016 : sadly this company no longer exists. This really struck a chord with me; I’m currently in a hate relationship with computer printers. I need something very simple that prints, scans and copies. It’s actually cheaper to buy a new printer than to replace the full set of printer cartridges on my current model. (The fact that it misbehaves badly enough to make me sling it across the room is additional temptation…). I hate this planned redundancy nonsense! Oh, I’d forgotten about printers… unspeakable manipulation of consumers and possibly the greatest deliberate waste of resources around. I can feel myself starting to fume even just thinking about it! I have to admit that we tend to hang on to all the products we buy, as long as we can keep them going – we really hate this consumer society, where the warranty for goods lasts longer than the actual goods themselves! The eco machine looks brilliant, doesn’t it? We will keep our existing washing machine going as long as we can, but I know what I will be replacing it with when it finally dies! I found this on eBay, Jan – thought you’d be interested! Hi – have you tried Philip Harris as a supplier of buffer solutions? They are big school suppliers and certainly sell the ones you mention. You could also try ebay for the individual sachets. If that fails email me and I will post some to you – I teach Biology! I also hate the throw away nature of modern appliances but am glad to say that where we live there is an amazing network of tradesmen who will have a go at mending nearly anything. Our washing machine was brought back from a near-death experience last week, and I am hoping for several years more service from it yet. Thanks for the offer… I have managed to order some, but I had forgotten about Philip Harris – thank you for reminding me. I love the idea of your washing machine having a near-death experience… let’s hope it has a long and productive life having been brought back from the brink! Now, that would be a real positive step. I have managed to buy some refillable white-board markers. It is a great little film – the message is so obvious really, but it needs saying explicitly. Don’t beat yourself up about not doing enough, though… if everyone did a something, what a difference we would make to our world.